"Inspiring Innovation. Growing Leaders. Advancing Kentucky." M. Christopher Brown II, Ph.D.
Kentucky State University (KSU) is a public historically black university in Frankfort, Kentucky. Founded in 1886 as the State Normal School for Colored Persons, KSU was the second state-supported institution of higher learning in Kentucky. It had a total undergraduate enrollment of 1,568 and a total graduate enrollment of 168 in fall 2016. Kentucky State University was chartered in May 1886 as the State Normal School for Colored Persons, only the second state-supported institution of higher learning in Kentucky. During the euphoria of Frankfort's 1886 centennial celebration, the city donated $1,500 towards the purchase of land for a new college on a bluff overlooking Frankfort. The new school formally opened on October 11, 1887, with three teachers, 55 students, and John H. Jackson as president. Recitation Hall (now Jackson Hall), the college's first permanent building, was erected in that year. 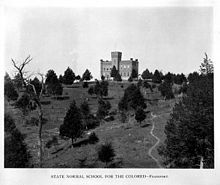 KSU became a land-grant college in 1890, and the departments of home economics, agriculture and mechanics were added to the school's curriculum. The school produced its first graduating class of five students in the spring of that year. A high school was organized in 1893. This expansion continued into the 20th century in both name and program. In 1902, the name was changed to Kentucky Normal and Industrial Institute for Colored Persons. The name was changed again in 1926 to Kentucky State Industrial College for Colored Persons. In the early 1930s, the high school was discontinued, and in 1938 the school was named the Kentucky State College for Negroes. The term "for Negroes" was dropped in 1952. Kentucky State College became a university in 1972, and in 1973 the first graduate students enrolled in its School of Public Affairs. In the spring of 2017, a majority of the faculty voted "no confidence" in both the full board of regents and board chair. Faculty cited many issues that influenced their vote, including tenure and promotion, funding, and the recent presidential search. Black faculty members, who had specific concerns about "racial disparities in promotion and tenure," formed a new "Faculty Caucus of Color" and held their own vote. In contrast to the vote held by the entire faculty, this vote expressed "highest confidence" in the board of regents chair and "no confidence" in the faculty senate president. Students are divided into four colleges, four associate degrees, 55 undergraduate degrees and six post-graduate programs. College of Arts and Sciences, offering degrees in Art, Biology, Chemistry, English, General Social Sciences, Mass Communication and Journalism, Mathematics, Music, Music Education, Music Performance, Political Science, Psychology and Spanish. College of Business and Computer Science, offering degrees in Business Administration and Computer Science. College of Professional Studies, offering degrees in Applied Information Technology, Criminal Justice, Education, Nursing, Public Administration and Social Work. The university also offers five liberal study degrees through the Whitney Young School (WYS) of Honors and Liberal Studies, which consists of a Honors Program, an Integrative Studies Program and an International Studies Program. The degrees include Africana Studies and Liberal Studies. The Paul G. Blazer Library, constructed in 1960, houses a collection of more than 700,000 items includes extensive reference, periodical and circulating collections of materials such as books, videos, microforms, sound recordings and others, to aid students in their course work and research. It is named after Paul G. Blazer, a strong supporter of education who was the founder and CEO of Ashland Oil and Refining Company in Ashland, Kentucky. As of 2014[update], Kentucky State University was host to 2,025 undergraduate students and 134 graduate students. African Americans comprised 49% of the undergraduate and 45% of the graduate student body. Kentucky State University teams participate as a member of the Division II Southern Intercollegiate Athletic Conference. The school's mascot are the Thorobreds. Men's sports include baseball, basketball, cross country, football, golf, and indoor and outdoor track and field; while women's sports include basketball, cross country, indoor and outdoor track and field, softball and volleyball. The Exum Center, the university's athletic and recreational complex, was named after William Exum, the first African-American varsity football player at the University of Wisconsin. Exum was hired as head of KSU's Physical Education department in 1949, and later made head of the Athletics department. He then became manager of the United States Track and Field teams at the 1972 and 1976 Olympics. Exum retired from KSU in 1980. Ezzrett Anderson One of the first African Americans from a predominantly African American school to play professional football when he joined the Los Angeles Dons of the old All-American Football Conference in 1947. He also played with the Los Angeles Mustangs. He played for the Hollywood Bears in the Pacific Coast League when they won the title. John Kenerson NFL, AFL and CFL player. John Merritt 1950 Former head football coach at Jackson State University and Tennessee State University. One of the winningest coaches in HBCU football. Inducted into the College Football Hall of Fame. Council Rudolph Jr. 1972 A native of Anniston, AL graduated from Cobb Avenue High School in 1968. In his senior season, he helped the team go to a 9-0-1 championship season. He earned all-conference honors and a scholarship to Kentucky State. In his senior season, Kentucky State ended 8-3-0 and played in the Orange Blossom Classic Bowl game. He was a Pittsburgh Courier Honorable mention. He was inducted into both the Kentucky State Athletic Hall of Fame and Calhoun County (AL) Sports Hall of Fame. Drafted into the NFL in the seventh round, he helped the St. Louis Football Cardinals win two NFC East Championships (1974 & 1975). He retired after playing 6 seasons in the NFL with Houston, St. Louis and Tampa Bay. Moneta Sleet Jr. 1947 Photographer for Ebony, won a Pulitzer Prize for his picture of Coretta Scott King at the funeral of Martin Luther King, Jr.
Effie Waller Smith ca. 1900 Educator & poet; poet James Still called her "Kentucky's Emily Dickinson"
Herb Trawick 1942 First black man to play in the Canadian Football League; played for the Montreal Alouettes 1946–1957 and was a seven-time All-Star; played in 4 Grey Cup Championships, winning in 1949; was inducted into the Canadian Football Hall of Fame in 1975. ^ a b c d e f "History of Kentucky State University". Kentucky State University. Retrieved 2014-07-14. ^ a b As of fall 2016. "Student headcount by level: All public institutions (2006-16)" (PDF). Kentucky Council on Postsecondary Education. Commonwealth of Kentucky. Retrieved 4 March 2018. ^ Rosalind Essig (March 25, 2017). "Faculty's vote of no confidence in Kentucky State University Board of Regents 'a crossroad' for school". The State Journal (Frankfort). Retrieved April 8, 2017. ^ Adam Harris (March 28, 2017). "No-Confidence Vote Exposes Racial Tensions Among Faculty at Kentucky State U." Retrieved April 8, 2017. ^ Adam Harris (April 7, 2017). "Black Professors at Kentucky State Vote No Confidence in Faculty Senate's President". Retrieved April 8, 2017. ^ a b "Enrollment Snapshot Spring 2014" (PDF). Kentucky State University. Retrieved 2014-07-14. ^ "Quick Facts 2013-2014" (PDF). Kentucky State University. Archived from the original (PDF) on 2014-07-14. Retrieved 2014-07-14. ^ a b "KSU Academic Programs". Kentucky State University. Retrieved 2014-07-21. ^ "Whitney Young School of Honors and Liberal Studies". Kentucky State University. Retrieved 2014-07-21. ^ "Welcome to Paul G. Blazer Library". ^ "Thorobred Yearbook 1960: Dedication and Opening of Paul Blazer Library (pages 100-102)". ^ "Welcome to The University Library". ^ Massie, Joseph L. (1992). "Blazer, Paul Garrett". In Kleber, John E. The Kentucky Encyclopedia. Lexington, Kentucky: University Press of Kentucky. pp. 87–88. ISBN 0813128838. ^ "KSU Thorobreds". Kentucky State University. Retrieved 2014-07-21. ^ "Exum, William". University of Kentucky Libraries. Retrieved 2014-07-21. This page was last edited on 6 February 2019, at 16:56 (UTC).